Frankly, mum had never seen her working so seriously while she was doing her homework. LOL! Anyway, This little cheeky is always allowed to use any of the computer or laptop at home. Partly because she’s quite careful and never simply explore the unknown icons on the screen. We certainly can trust her on handling it even if the laptop warranty was over. Ha! This is what happened on Monday night. I was watching Barbie cartoon in youtube. Then, mum came over and said something. I heard that. But, I made no response, but just continue watching. Also, mum just step out of the room. Then, I just walked to my table and started doing my grammar and vocabulary work once I finished the cartoon. That was a great surprise for my dear mum.She was so happy that I finally learn to keep an eye on my work even though I was still talking, skipping or moving around after every single word I wrote. Ha! Today, I enjoy playing pretend about going to school. It’s such fun! But, I don’t want to wake up so early and go to school every morning. I want to stay at home! I cried again this morning. Wow! She is truly angry this time. 😯 Better don’t challenge her. I kept very quiet and stopped crying. LOL! You know that’s not safe, don’t you? Recently, you always like to lie down on the sofa and watch TV. I think that’s the process of growing up. You just started to get lazy, isn’t it? LOL! Sit up, baby! Sit up! How about that? You will always have new idea, don’t you? That’s challenging! But, don’t do that please, baby. Also, lying down while watching TV is going to destroy your vision. Wearing glasses is nothing like wearing the safety glasses too. You just can’t take it out and put it aside after you have finished your job. Once you are shortsighted, the glasses will have to follow you for life unless you want to take the risk to go for laser treatment. However, the heavy rain just stopped. We were all wet as we tried to get into the car, which was few minutes walk away. Unbrella seems useless as the rain was too heavy. But, you still insist that you like raining. You said, you like to see the water flowing everywhere while raining. LOL! Yeah… But, she practically chased a girl who is trying to play in the play house with her away. She was shouting at her. So loud! Extremely rude! But, that’s a public playground in Queensbay Mall, girl? Also, the “Jie Jie’s” daddy is just right there watching. And, only school with lots of school and classmates can help. LOL! By the way, this shameful scene happened on last Sunday. And once she put on this magic uniform, she stop crying. I wondered how. But, it just happened. So unbelievable! May it because she was touched. As mummy try to look into her eyes and keep hugging her, showing 2 thumbs up last night, while trying to convince her to become a brave girl who will never cry in school? So, she finally decided to be as brave as Bumble Bee. Yes! She loves TRANSFORMER! Ha! Or may it because the uniform makes her feels as the same group with her friends in school. Sense of belonging I mean. Or it just simply means ” I like the uniform”. Hehe….. Anyway, mummy was so touched. Tears nearly burst out just because of this simple occasion. Cause it really means so big to mummy. May be all the while mummy appeared to be so cruel. Just keep sending her to school even though she sheds tears. The truth is… mummy is not cruel at all. Not as tough as it seems too. Mummy actually feels so sorry and upset, each and every time sees her crying. So worried! But, I have to pretend nothing big and just be persistent. As that’s the only way to help little Elizabeth understands that there is always something we need to obey even though we don’t really like it. Also, she just have to learn to be independent. Since May, she was trained to live without TV. Of course, we will still watch a movie together once in a while. It’s just another family time. And, I realized there are also fantastic free learning programs for toddlers online. All of all, thanks to the internet. As we can buy books, food, fashion, almost everything, even ceiling fans online. That’s the comment mummy get from most experienced early childhood specialist. Alright! Mummy is not taking the risk anymore. Busy cutting down her TV time. You will have more TV time after 6 years old. Mummy promised! My fever is only around 38 degree yesterday. Save mom from lots of worries, I knew. Thus, she even went to the market to buy vegetables. And, spend time in settling the auto insurance quotes. Then, drive straight away to the post office to claim the goverment reimbursement for petrol. But, she insisted that I need swapping when she was back. I cried! I shouted! I kicked and struggled! Immediately, I got punished from being tantrum. Mom put me at one corner in the room. Then, just keep swapping wihtout concerning my terrible temper. Innitially, I cried louder. And, keep shouting for “kakak”. Slowly, I cried softer. Finally, I stopped. And, I surrendered to the swapping. Mommy will never beat Elizabeth. As I think that’s torturing and hurtful. But, she definitely needs some minor punishment like this, setting her up at a corner and just let her cry. At least she can learn that she had did something wrong. Daddy! Please don’t get mad with mommy, ok? LOL! My girl is interested with coins more than paper money. May be it’s more visible. Daddy always place the coins on mummy’s dressing table whenever he is at home. And, Elizabeth will try her best to reach them. She will ask mummy to get her onto the bed. As the dressing table is placing side by side to the bed, she will lean on the table side as she climb up the bed. Then, she start looking for coins. She knows that she is not allowed to pick up the coins. As mummy insists that coins are dirty. Still, she will stretch her hand out to reach the coins if she sees them. Toddlers just won’t follow instruction, don’t they? May be daddy should put his remaining coins in some other places. Hide it. As she won’t look for it, if it is not seen. Mummy just want to make sure that she won’t fall from the bed again because of a few pennies. Elizabeth is getting very fierce since last week. She will “roar” like tiger or lion when she gets mad. Mummy hates that! That’s irritating. Obviously, mummy can see that she is a hot tempered type. Mummy is worried. But, what can mummy do to “tame” her? Anyone has any good suggestion? Somehow, mummy must first stop “kakak” from roaring at her. Didn’t she understand that roaring back to Elizabeth whenever she did it first will make things worst? That will make Elizabeth think that it’s ok to roar like this. LOL! Both “kakak” and Elizabeth! Stop roaring! Daddy is a smoker. And, he is trying so hard to avoid smoking in front of our little princess. But still, she knows that daddy will bring along his cigarettes and lighter everywhere he goes. In this case, mummy is worried that she might learn how to smoke in the future. May be it’s time for daddy to consider drug rehabilitation! Elizabeth loves pen these days. She can hold a pen nicely. Once the pen is on her hand, he will start drawing. Thus, mummy taught her to draw on papers or books. Otherwise, she will draw on other things. I got a pen and paper now. Where should I settle down to write? Don’t disturb me, mummy! I am busy writing! LOL! Luckily, she still don’t know how to operate this “mechanical pen”. And, mummy never show her too. So, everything in the house is still save. She still draw nothing on the paper. And, she can neither draw anything on mummy’s bed. I can hardly sit still in the car. I will demand to sit in the front seat with mummy and I will try my best to drive together with daddy too. Somehow, I will stay with “kakak” or granny at the back seats if I can’t go to the front. Now, I learn to open the window. It’s easy cause I just pressed on one of the button on the armrest, then it will scroll down automatically. However, daddy never allow me to do that. Oh, Dad! Please… Once the window is open, I can feel the air or touch the rain with both of my hands out, touch the ventshades, leave my head out and have a clearer look of everything out there. 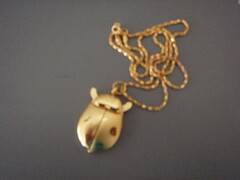 I have bought a few “gold bug” pocket watches from Hong Kong as I like it so much. I think it’s striking and cute. I am thinking Elizabeth will like it too. And, it’s suitable for other kids as well. Somehow, nowadays most parents will try their best to provide the best to their kids if they can afford. Me and hubby have the same opinion too. But at the same time, we will discipline Elizabeth in terms of spending in the future. We don’t want her to be spoiled. At least she has to be smart enough to balance her spendings and earnings. Now mummy thinks I am too fat. Mummy is busy finding out what’s wrong with my diet. Am I eating too much? Anyway, I don’t even start taking meat. I am only taking soup or porridge that cook with meat. 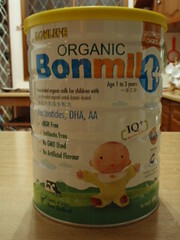 So, may be it’s Bonmil. Anyway, it’s a bit difficult for baby Elizabeth to slim down as she is just a toddler. If we adults gain weight, we may have many options to slim down including taking diet pills. However, it is not suitable for toddler. And, It ain’t easy to train her to exercise everyday either. In fact, she walks in the house all the long. I think she is having adequate exercise. So, it’s pretty obvious that she has over ate.